This month's challenge was a a surprise it was to make a bombe using home-made ice cream with fudge sauce with a covering of Swiss Rolls. This was going to a fun challenge. 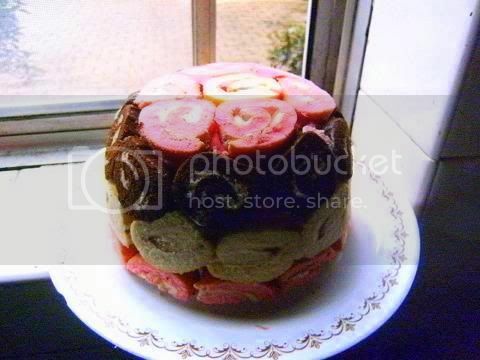 I thought I would be a trial bombe and then make another one for my birthday party. The recipe for this month’s challenge has been adapted from this Swiss swirl ice cream cake from the Taste of Home website. 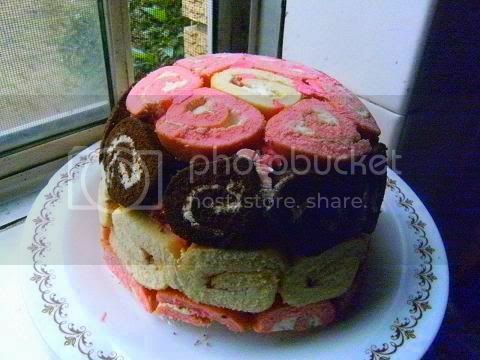 Slices of Swiss roll are used to line a bowl and then filled with vanilla ice-cream, hot fudge ice cream topping and chocolate ice cream. The picture looked like so much fun that I have been waiting to make it for a while. 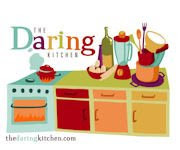 What better timing than to make it along with fellow daring bakers to celebrate my three years with this amazing group. I have taken the basic idea from the above website and have developed the recipe. Hope you like it. The recipe does not require a lot of hands on time, but definitely requires a lot of cooling and freezing time between layers. Unlike the original recipe, we are going to make each layer from scratch. So, if you are planning to make it in one day, it might be a bit of a struggle. Here is a link to the PDF of the challenge recipe. It has been so cold in Sydney (the coldest in sixty years at night it's below zero Celsius burrrr!!!!) that I thought I would spice up the recipe a little to make it more summery also I needed to experiment a little because I want to make another ice cream swirl cake for my birthday party on Saturday. So I decided to do four types of ice cream since I had a lot of the crème anglaise already frozen left from the last challenge I used these leftovers to made sour cherry ice cream and coffee ice cream and used the challenge recipes to make chopped pistachios with pistachio nut butter ice cream, and vanilla ice cream. I have been making vanilla-sugar for the last two months I used that instead of the minced and chopped vanilla bean in the recipes. (To make vanilla-sugar place a few vanilla beans in sugar and wait for a fortnight or much longer, vanilla-sugar delivers a very intense vanilla flavour to your recipes much stronger than using fresh beans!). I made the chocolate Swiss rolls (adding a reasonable amount ½ tsp of chilli powder) and filled it with half cream and half hot fudge with a touch of chilli powder I've had too much chocolate lately and couldn't face a large amount of it in this cake. I made sure the Swiss rolls where mini-sized so I could line the bombe with a large number of swirl slices. I added a 1/8 teaspoon of dry mustard powder and two plain melted marshmallows to each cup of ice cream; the use of mustard powder has been shown to increase the intensity of the flavour of ice creams so I always include a touch in all of my ice creams, while using melted marshmallows helps stop the formation of large ice crystals in hand-beaten ice cream. Of course most bakers know that chilli powder intensives the flavour of chocolate in recipes. The use of mustard powder and chilli powder stimulates the taste buds which makes them more receptive to the other major flavour components in your ice cream, you shouldn't be able to taste the mustard in ice cream recipes. Of course I placed the cocoa powder for the Swiss roll in the boiling water since it has been shown that cocoa powder flavour is intensified in cakes if placed in a hot liquid for a few minutes. 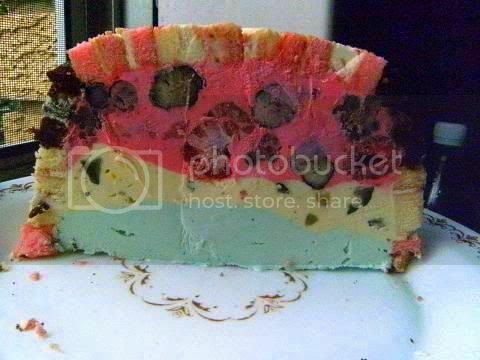 I also lined the bottom of the ice cream cake with slices since I had enough to do it and covered that with the vanilla ice cream for some reason the vanilla ice cream soaked into the slices so you couldn't really see that layer in the photos but you could really taste it in the final cake. I did notice that I needed almost 2 litres of ice cream as per the recipes to fill the 1½ litre bombe (in fact a Chinese soup bowl) I used I think this is because I made the ice cream by hand and not in an ice cream maker which aerates the produce so much better than just beating the ice cream with a hand mixer every 30 minutes or so. OMG when I opened the ice cream cake to study it the smell of it was amazing ice cream usually doesn't have an odour but this Swiss swirl cake did you could smell it across the kitchen to the dining room it smelt strongly of vanilla then coffee with an undertone of pistachio. I'm not sure why the smell was so strong. 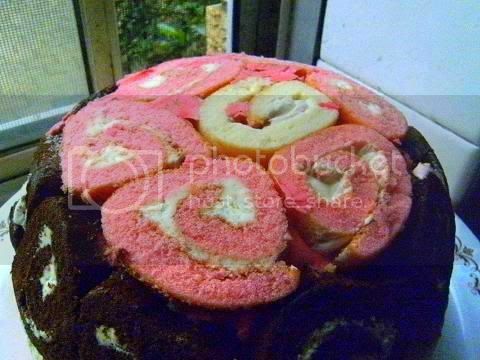 The final ice cream Swiss roll cake had very strongly flavoured layers each distinct yet the overall flavour profile was harmonious. I really liked the look of the final dessert and the chocolate cake layer was just enough chocolate for the rest of the flavours. The hot chilli chocolate swirls were a great foil against the flavoured ice creams. 1. Remember to make the flavourings very strong for the ice cream since cold substances slightly numb the taste buds. 2. Whipped cream or whipped evaporated milk, melted marshmallows, gelatine and beaten eggs are all additives used to prevent the formation of large ice crystals in ice cream as well as to improve or vary flavour. 3. Let the finished ice cream sit for at least four hours to help develop flavour. 4. 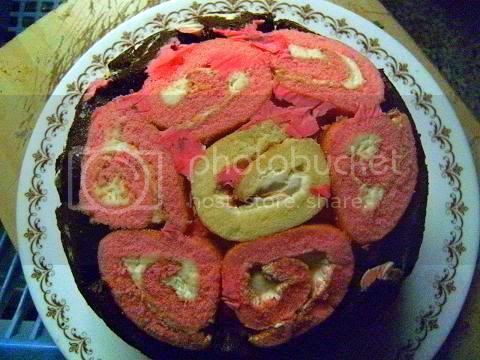 See this blog posting on how to test scientifically when the Swiss roll batter is ready (i.e. when it has a specific gravity of .5 to .55) I used this method it really does work and takes all of the guess work out of the perfect Swiss Roll this will really open your eyes on how professionals do it I always do this now. 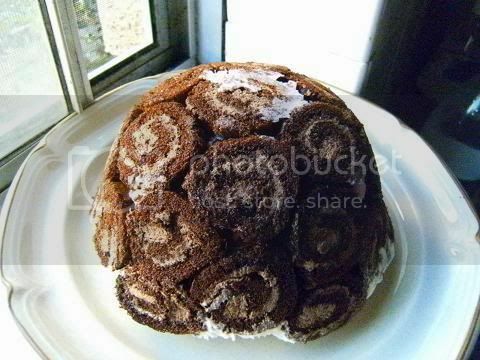 See here for some excellent examples of jar-dropping beautiful Swiss Rolls on the same blog. Not a bad trial overall now for the birthday cake version! Total time for this recipe was about 10 hours mostly waiting for the ice cream to set and harden etc, it really is a fairly simple recipe. Thank so much Sunita for such a wonder recipe and all the fabulous step-by-step photos. This is such a fun dessert for kids and they would just love helping to make it. For my birthday swirl ice cream cake I made three types of Swiss rolls, prickly pear (which tastes like watermelon), boiled chocolate treacle and vanilla sugar. 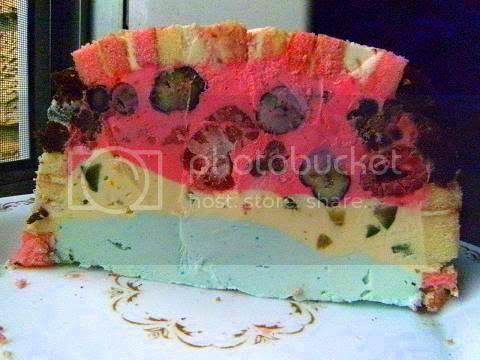 For the ice creams I made my favourite flavours – (red layer) Mixed Berries, (middle layer) saffron, honey and candied fig, and (last layer) blue champagne. It was such a pretty cake with nice contrasting flavours it went down well at the party. I made 3 cakes like this for the party since I had a lot of people attending. The party was held over two days and about 60 people attended at various stages it was fantastic I had a wonderful time and my present from my friends was a week's holiday in New Zealand at the end of the month and a huge food processor from my family. See here for a great example of the above instructions. Hi Audax! I can see you had a wonderful time in NZ! When it comes to commenting on your challenge, I never have enough words, everything is so beautiful, delicious and detailed! Congratulations! Your bombes deserve an award! Once again, you have blown me away!! I love the colors of your creations, and it it soeasy to see how much fun and love yo put into your work. Happy belated birthday, and here's to many more years or mouthwatering treats!! Happy birthday! How delicious that bombe looks more than makes up for having to make your own birthday cake... :) I am so intrigued by your pistachio ice cream, and you have me totally wanting to taste a prickly pear. Awesome work! Thanks for the tips on the mustard powder and marshmallow. Since, I hand churn my ice cream, definitely useful to me!!! Happy Birthday Audax! Your cake looks spectacular! I am curious to try the chili chocolate. And New Zealand looks beautiful too! Happy Birthday, Audax. Both cakes look great, the blue champagne ice cream sounds intriguing! Sounds like you had lots of fun in New Zealand! Your trip looks fabulous. What a beautiful part of the world. It's fun that you posted the video of the haka. My son's high school football team always does the haka before their games. We have a lot of Polynesian immigrants in the area. Once again, a very impressive job on this challenge. I love how colorful they are. Hi Audax! Both your cakes are amazing: full of different colors and flavours! wow - a sunny day at Milford Sound - a real birthday gift!!! And yes,love the pictures of your trip. You always make the most beautiful looking concoctions! Now that I'm sufficiently hungry from looking at that, must go make something for dinner! 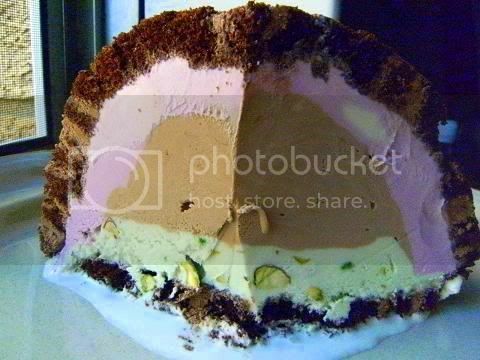 You always use such wonderful flavours & I love the colourful layers of ice cream inside the bombes. It's so striking! Glad you had a good holiday. It looks so beautiful there. Wow, I was checking out your blog because of the Icecream cake but have been blown away by the pics of New Zealand! You must have had a brilliant time! It's on my list of places to visit! I have made a link on my post to yours. I hope you don't mind. Your flavours are exquisite and the tips brilliant! Thanks! Audex, you sure got some beautiful shots of New Zealand. It looks like it's absolutely stunning over there! Your bombes are stunning too. I so wish I could spend just one meal at your house and try some of the amazing dishes you put together. Audax, They're all beautiful, but your birthday bombe is my favorite! Your birthday trip to New Zealand looks amazing! Gorgeous photos and I love the Haka dance. My son went to college in Hawaii, so I've seen that dance performed there before, but it was fun to see it again:) Have fun with your new food processor and HAPPY BIRTHDAY!!! Audax...you are amazing! Your cake is beautiful and so are the pictures of your trip. Happy Birthday! Mmmm you made two swiss swirl cakes yum!! Double the work but double the yumminess hehe, they both look gorgeous! Happy belated birthday Audax...can see you went to town with the challenge. 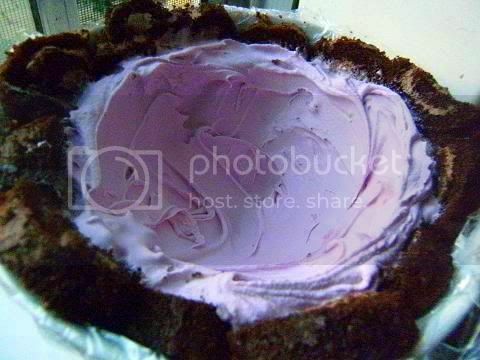 Love da bombe and the flavours; la exotic! Thanks for sharing the NZ pictures. Am sure you had a great time!! As usual you were very creative! That bombe looks so pretty, colorful and delicious. A lovely combination of flavors and textures! Very well done. Wow, New Zealand is an incredible place! Those landscapes are amazing! I think it is useless to say you did a great job. You ALWAYS do! I liked the colours and the combinations you'd done. It seems you had a wonderful time in NZ. I want a birthday present exactly like that! I know it's a bit late, anyway HAPPY BIRTHDAY! Your creativity is such an inspiration! Lovely cakes and wonderful flavors. You've outdone yourself. So glad you had a great time in NZ!! 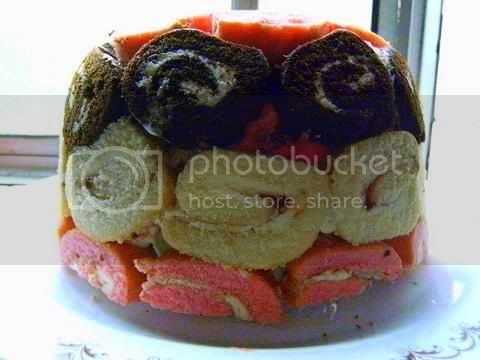 Well, you have created a phenomenal tri-colored swiss roll ice cream caked that is so beautiful. Wow, both versions look great! And what a fun birthday trip from your friends! Happy belated birthday and what a great trip to New Zealand! 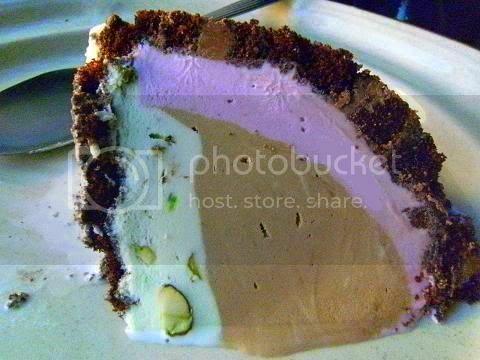 My hubby now wants pistachio ice cream after seeing yours in this dessert. It looks fabulous! Your cake looks so gorgeous Audax, those color are so beautiful and the flavor combinations are delicious I know. About your trip...I Love NZ they speak English there you know, so next time you go there call me to be your interpreter (I won't charge)ha ha ha ha ha XD.Beautiful pictures. HAPPY BIRTHDAY MY DEAR FRIEND, ALL THE BEST WISHES. Ps. Do you think the All Blacks would come here and perform that chant in front of that annoying neighbor I have? Aud - Number one, Happy Belated Birthday, my pa *HUGS* Number two, your vacay to NZ looks awesome - love the photos! Number three, your bombes are gorgeous and the photos stunning! The blue champagne and prickly pear ice cream are so unique and intriguing! I once tried prickly pear candy from AZ, and loved it. I can only imagine how amazing the flavor is in an ice cream. YOU are the 'bombe'!